« Was Jesus executed on ‘Good Friday’ or a Wednesday? IN recent weeks, EU Defence Ministers, met in “PESCO format” for the first time. 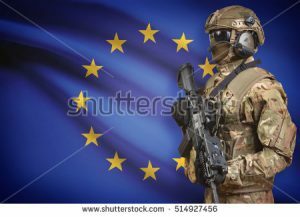 1) This legally binding EU decision mandates PESCO member states to increase defence budgets, to provide troops (on stand-by) for use in EU Battle-Groups, to join “structures partaking in European external action in the military field”, and for “common funding of military CSDP operations and missions”. 2) It states quite bluntly that “increasing joint and collaborative defence capability development projects, is among the binding commitments under PESCO”. US President Donald Trump, as well as former Secretary of State Hillary Clinton, have called for Europe to beef-up its militarily–and Europe is doing this. But the USA will NOT like what will arise in Europe. Regular readers of this page realize that for many decades, Church of God ministers have written that Europe would have a great army and that Germany would dominate that coming military. This is because of various biblical prophecies (e.g. Isaiah 10:5-12; Revelation 13; Daniel 11; see also Germany in Biblical and Catholic Prophecy). The PESCO arrangement involves spending more money for European military technology research (see European Technology and the Beast of Revelation) . While Europe has been relying on the USA for defense, the time will come when Europe concludes it not only does not need the USA, but that it wants to take it over! We are seeing Europe changing and working to build its military–yet the mainstream press pays little, if any, attention to it. Europe will ultimately use its military in a way that will lead to the end of the USA (Daniel 11:39; see also USA in Prophecy: The Strongest Fortresses). This entry was posted on Wednesday, March 28th, 2018 at 6:30 am	and is filed under Prophecy. Newsweek: Putin is Preparing for World War III-Is Trump?